The Australian Government Primary Principals Association (AGPPA) is calling for decisive government action comprising of a clear federal vision and resource investment to ease pressure on government primary school principals. The Australian Government Primary Principals Association (AGPPA) is calling for re-examination of the Australian Curriculum following identification of weaknesses that could detrimentally affect student learning outcomes. All government principals across Australia have just received a letter that encourages schools to put in a submission to the Senate inquiry into school funding. Disadvantaged students will pay the price if the Coalition reneges on Gonski funding promises, say government primary principals across Australia. The Australian Government Primary Principals Association, AGPPA, representing over 5400 government school principals around Australia, met recently in Melbourne. 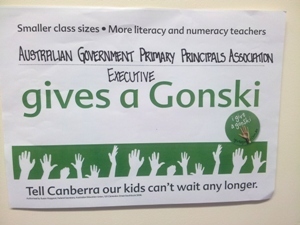 AGPPA Demands that the Gonski Funding Model is implemented for the good of all government primary school children. The Australian Government Primary Principals Association, AGPPA, representing over 5300 government schools principals around Australia, met recently in Canberra. The Australian Government Primary Principals Association, AGPPA, representing over 5300 government schools principals around Australia, met this week in Brisbane. The Australian Government Primary Principals Association, AGPPA, representing over 5300 government schools principals around Australia, met this week in Canberra.